Is Your Organization on a Quest for Greatness? Looking for a LEGO® workshop? We have Certified GLOBAL facilitators ready to meet your workshop needs! All organizations must set a vision, goals, and objectives aligned with their values in order to move strongly and confidently into the future. Organizations able to out-imagine their competitors are going to be the ones that hold and capture market share. These are the organizations where organizational intelligence functions at the highest levels and cascades down to all members. For years, senior leaders have known there must be a better way to share their vision and inspire leaders. We have the method. Why have another talking meeting with PowerPoint when you can hold a dynamic and fast-paced LEGO® SERIOUS PLAY® methods workshop with 100% engagement? Everyone builds in 3D and walks out knowing exactly where they are now, where they are going, and what they need to do. If you are looking to out-imagine your competitor, set measurable outcomes, move your organization towards its strategic goals, and remain relevant in an ever-changing market, this session is for you. "This session came at a time of significant transition for our organization and we could not have been happier with the results. The use of LEGO as a visualization tool created a tangible way for everyone to express the challenges they see in the organization's future and a basis to collectively work on envisioning the best path forward. I was particularly impressed by the structure of exercises and how they reinforced the value and perspective of what each particpant was expressing. Several Board members commented on the refreshing take you had a strategic planning, and how motivated they were to move forward. The structure of the entire day was fresh, fun and was -in my experience - the most effective session I have particpanted in. " All teams within the organization must set their goals and objectives so they are aligned with that of the senior team. After the senior team provides an outline of its strategy, each team within the organization should develop its own department targets and strategy to move the organization forward. When the teams are able to understand the goals of the senior leaders, they too can design and develop their goals and targets. Because this will all happen in 3D while building with LEGO®, the teams can build, construct, and reimagine goals to drive results. If you want your organization working for you, this workshop is a must because it will get the most out of every team or department in your organization. "Assembling 3D models as a strategy for developing personal and senior team-building insight was an extraordinary experience. Progressive reconstruction of the pieces provided information about each other that otherwise would have been impossible to achieve in the short-term. It is an amazing transparent exercise that creates a deeper level awareness of senior team interdependence. Lloyd Smith’s facilitation skills are first-class." Globalization and technology have changed how we think about strategy. In an ever-changing business environment, leaders who can think in agile ways and adapt quickly will lead the organization forward. Leaders who take time to consider multiple stories about the future and then test their thinking against moving variables will be the winners in this new game that leaves nothing to chance and everything to those who have already considered the system and understand the impact. Why take risks in the market when you can think strategically and play with your strategy in 3D with LEGO® SERIOUS PLAY® methods? This workshop gives you the table to create and build your strategy so everyone can see what is happening and what you can do to plan and lower risk. Research indicates this is the best way for the brain to think at the deepest levels, where innovation and insights are mined. If you want to ensure a sustainable future, this is the session for you. "Jacquie led our senior leadership team through a LEGO scenario-testing exercise, which was an excellent and innovative way to explore our insight into the organization's future. The exercise encouraged us to engage differently with the usual list of stakeholders and risks, using a hands-on approach that was inclusive and creative. I found the visual and interactive aspects very valuable, setting the scene for us to lead by example as we evolve into a culture of innovation and collaboration." During times of rapid change, we need leaders who can problem solve quickly and instill confidence in those who follow them. This is no easy task. This workshop will highlight leadership and team strengths in a supportive environment and illustrate new ways to lead followers. We will begin with a psychometric assessment, aimed to highlight the diversity of thinking. We will move on to building in 3D with LEGO® SERIOUS PLAY® methods so all the leaders can discover their superpowers. This workshop is a game changer and will prove to be your team’s hidden advantage. Leaders who inspire others to follow do not just lead. They lead through change and inspire their followers to meet the organization’s strategic goals. All of this enables leaders to thoroughly surface perspectives that oftentimes are held but not shared, understand and align around shared meaning about an organization’s reality and/or potential future, and gain clarity about actions that will help bring them to their desired end state. Finally, Jacquie is great to work with, extremely creative, and excessively generous with her time. I can’t recommend her, her work, and the LSP method more highly. " The development and redesign of both products and services require developers to think like designers and continually improve products and services to meet the needs of end users. This workshop, designed to meet in-house needs and requirements, will follow the path of the user (your customer) to understand where you can make improvements and develop innovations to meet consumer needs and wants. We do this all in 3D with LEGO® SERIOUS PLAY® methods. Consumers/customers are more sophisticated now than ever before. They expect services and products to not only satisfy their needs but to delight them long after their interaction with your service or product is over. Do you want people to recommend you to their family and friends? Would you like your products and services to be the number one choice in the market? If these are your goals, this workshop is for you. The shortest distance between two people is a story. Stories are the most brain-friendly way to share information. Having 3D models as artifacts in our process ensures stories are not only memorable but will be available when you need to make decisions in the future. Storytelling and story making are two different processes, and both play important roles within learning organizations. In order to inspire people to act, follow, purchase, or engage, leaders, brands, and organizations must be able to tell inspiring and compelling stories. This workshop takes a product or service and runs it through the storytelling process to uncover potentially game-changing insights. If you want people to be inspired by what you do or sell, this course is for you. "In my experience, Strategic Play has been very effective to create physical constructs/artifacts among senior executives to represent complex problems and strategies that enable deep conversations leading to new insights and strategies. I really value the methodology for enabling conversations free of bias and the flexibility to create scenario simulations in real time in a very simple and practical way. These scenarios are instrumental in creating robust strategies in multidimensional situations that are difficult to examine with traditional board meetings. The fun and engaging elements of the methodology are nice “icing on the cake”, the real benefit is the breakthrough insights that are discovered leading to more robust business strategies. Having Jacquie and her team facilitate brings experience to the next level. Jacquie brings a wealth of business application experience together with a masterful ability to sense the audience and course correct on the spot to achieve the desired outcomes. As part of my role, I benchmark and validate Best in Class strategic partners on Innovation. I can say that Jacquie’s organization is Best in Class." Still running to put out fires? We know how exhausting that can be when you are working to solve the unsolvable. It is painful to be struggling with the same problem over and over again. When circular thinking keeps you stuck and you cannot move forward, you keep trying the same thing and get the same results. Now it might be time to try a new process, a new approach, a brand new way to think. This process in 3D revolutionizes how people think, how they work together, and how they solve problems. Do not get trapped into fixes that backfire or solve the wrong problem. We know how to move you forward and help you think within a system so you can be agile, flexible, and adaptable with your solutions. We have the process and you will build the right answer that works for you. "The City of Surrey consistently works to innovate in an effort to best serve our residents in an evolving landscape. Jacquie and Stephen lead our team through the Serious Play problem-solving model which stretched our thinking and perceptions of innovation in ways that we didn’t expect. The outcome was a highly engaged team that felt that they had all contributed to solving sticky problems with tangible outputs that were immediately usable by the City. Not only did the sessions stretch us at a team, they reshaped the way that we approach challenges as a City." Most organizations today depend on teams to get work done. Leaders want teams to be self-organized, to work collaboratively, and to create higher-level products and services that are clearly the result of collective group genius. Unfortunately, teams often do not function this way. People become disengaged, team members become political, or they fear their work will not be recognized. At the worst, the team is in conflict and the members are disengaged and not aligned with their goals. Not all teams are working at this very poor level, most manage to get by. But how many teams are truly highly functional? What if the people on your team worked at the highest level? What if every team within the organization worked at the highest level? What if every team was engaged and understood how to reach and maintain peak performance? What if every team clearly understood its goals and how its work pushed the organization toward its strategic objectives? If this were the case, you would have a highly functioning organization. It would be unstoppable no matter the market conditions. 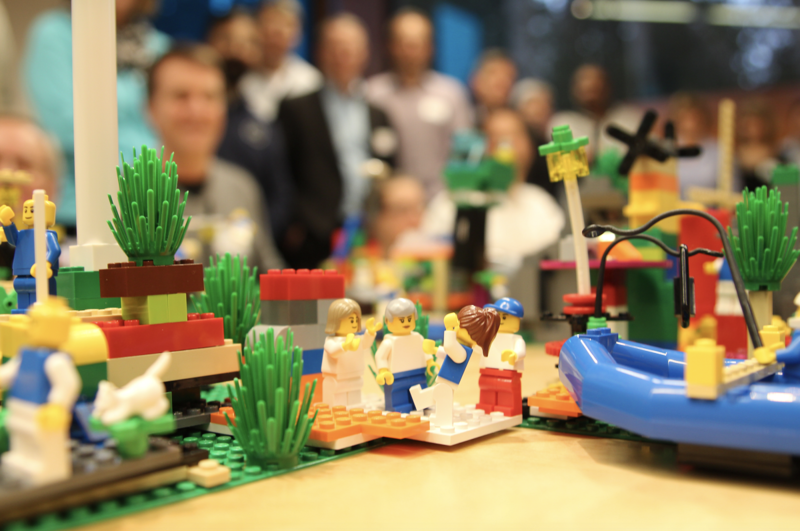 "Our teambuilding day using LEGO® SERIOUS PLAY® methods was an outstanding success. With Captivating simplicity, the workshop was a powerful approach to unlock the full creativity of staff. The progression of skill-building exercises creates a uniquely grounding experience of three-dimensional self-discovery interwoven with genuine team values. It was wonderful to see how working with LEGO allowed staff to tap their creative potential and further the goals of the session by achieving full contribution by each participant." This workshop has been designed to help project teams work better together. We know that organizations want high functioning and self-organized project teams, but often lack the processes needed to help teams get there quickly. Research indicates that teams that are well organized with a clear understanding of their work, share information faster, communicate better, manage conflict quickly, and produce better results. All teams within an organization should be working together to help the organization reach its strategic goals. Organizations with high functioning teams are less likely to waste valuable resources and finish projects within scope, on time and on budget, capturing a larger market share. If you are looking for a fast-paced workshop based assignment to really improve team performance, this workshop is for you.